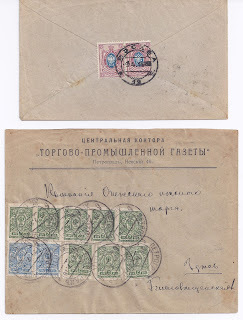 For much of the Imperial and Soviet period, reduced Tariffs applied to mail sent within the city limits of Moscow, St Petersburg / Petrograd/Leningrad and some other cities. You would expect to see a lot of such mail - lots of businesses are local businesses, lot of families are in one city but spread out in different districts. But at some periods you don't see a lot of local mail. Just now, I am mounting up a collection of covers and cards for the Tariff period February - September 1918. It's quite a long period of time and I have a lot of postcards at 20 kopecks, inland letters at 35 kopecks and inland registered letters at 1 rouble 5 kopecks (the Registration fee set at 70 kopecks). But I have just two local letters at 30 kopecks and 2 local Registered letters at 1 rouble ( 30 + the fixed Registration fee of 70 kopecks). 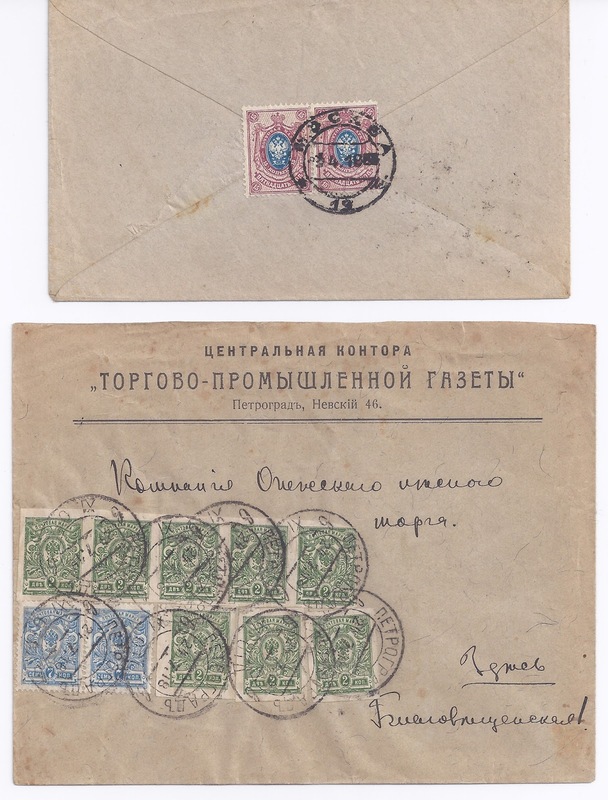 It's relevant that these charges are high both with respect to previous and later tariffs: the postcard rate had jumped from 5 to 20 kopecks but drops back to 10 kopecks in September 1918. And the discount on local letters (30 kopecks against 35 kopecks) has been reduced (in percentage terms): the previous differential was 10 kopecks for local against 15 kopecks for national. The September 1918 Tariff improves the relative situation again with 15 to 25 kopecks. So in the period February - September 1918 sending a local letter was relatively more expensive than it had been or would be in future. I tried to find some data on Moscow and Petrograd wages in 1918. Googling yields figures which suggests that 10 roubles a day would be a good skilled worker wage and 5 roubles a day the sort of money a junior clerk in an office might get. So if you had an office regularly sending out local letters or local Registered letters it would make sense to ask whether some or all of them could be delivered by a junior clerk walking the streets or riding the trams. It's not the middle of winter, and even if it takes all day, it will be cheaper to walk deliver by hand six potential Registered letters which would cost a rouble each to send than it would be to walk them to the post office and pay 1 rouble each for them. 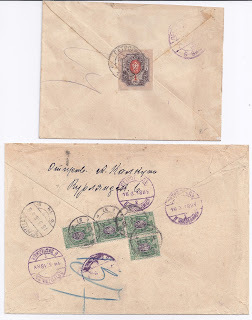 In my small group of four letters, shown below, it's interesting to see the use of 2 kopeck imperforates, some pre-separated, on a letter from a Gazette which I guess was set up to send out Printed Matter at 2 kopecks.